Harley Williams (7) in action for Peterborough Northern Star at Eynesbury. Photo: Tim Gates. Deeping Rangers suffered penalty shoot-out agony in their FA Vase first qualifying round replay last night (September 13). Deeping were 2-0 up against Walsham Le Willows at half-time at Outgang Road, 3-2 down in the final stages and then 3-3 after 90 minutes thanks to a late Scott Coupland penalty. Laureno Da Silva (red) on the ball for Peterborough Northern Star at Eynesbury. Photo: Tim Gates. There were no further goals in extra time, but Luke Avis, Jason Kilbride and Will Bird all failed to convert their spot-kicks enabling the Eastern Counties League side to progress 5-4 on penalties. Coupland and Charlie Coulson had fired Deeping into their half-time lead. Wisbech Town also bowed out against Eastern Counties opposition. 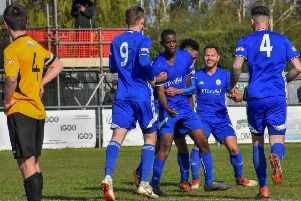 They were 3-0 down at the break at Mildenhall who added one more goal in the second-half to ean a second qualifying round tie against Peterborough Sports. Peterborough Northern Star were undone by a couple of old boys in their United Counties Premier Division match at Eynesbury. Former Star players Craig Smith and Hayden Bream were among the scorers in a 3-0 Eynesbury win. Title favourites Peterborough Sports will attempt to regain top spot in the top flight by winning at Sleaford tonight (September 14). Newport Pagnell reached the summit last night with a 2-1 win at Cogenhoe. Unbeaten Holbeach United could go second with a win over lowly Huntingdon at Carter’s Park. (After extra time, WalshaM Le Willows won 5-4 on penalties). Eynesbury 3, Peterborough Northern Star 0.